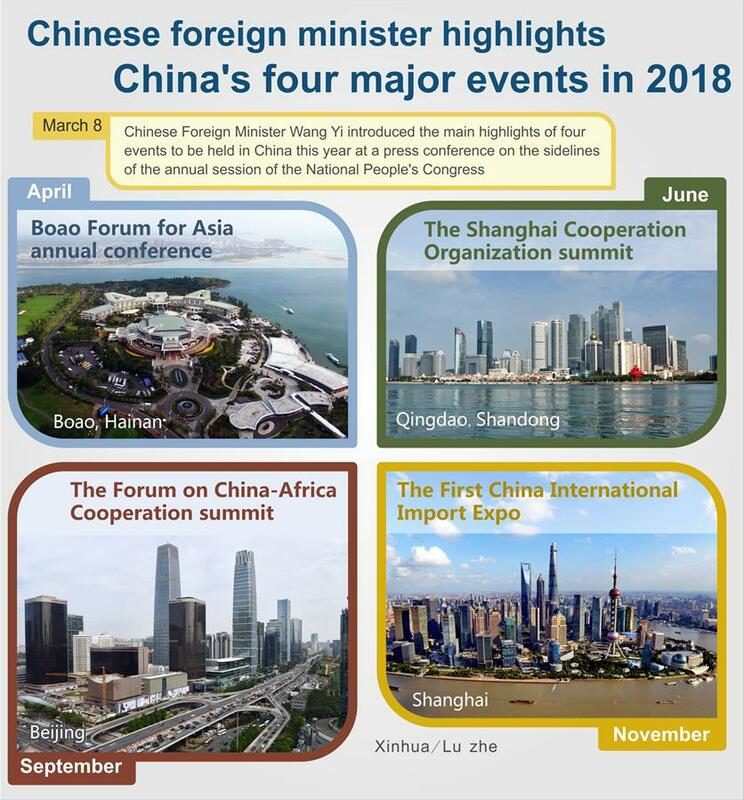 BEIJING, March 8 (Xinhua) -- China is hosting four events this year which feature highly on the country's diplomatic agenda, Chinese Foreign Minister Wang Yi told a press conference Thursday on the sidelines of the annual session of the National People's Congress. First, the Boao Forum for Asia annual conference will take place in Hainan in April, and focus on reform and opening-up. Second, the Shanghai Cooperation Organization summit will take place in Qingdao in June, and focus on revitalizing the Shanghai Spirit. Third, the Forum on China-Africa Cooperation summit will take place in Beijing in September, and focus on the Belt and Road Initiative. Fourth, the First China International Import Expo will take place in Shanghai in November, and focus on further market opening. Xi Jinping, general secretary of the Communist Party of China (CPC) Central Committee, emphasized in his report to the 19th Party congress last October that China will work with other countries to foster a new type of international relations, and to build a community with a shared future for humanity. "This is the aim of China's major country diplomacy in the new era," Wang said. Xi also stressed in the report that the CPC strives for both the wellbeing of the Chinese people and human progress. To make new and greater contributions for mankind is the CPC's abiding mission, according to Wang. A committed and responsible China will adopt a more visionary foreign policy, said Wang. "We are determined to build world peace, contribute to global prosperity, and safeguard the international order."